The 11th Chennai International Film Festival (CIFF) kick started today, 12th December, at the Sir Mutha Venkatasubba Rao Concert Hall. Last year the inaugural function was graced by the Big B, Amitabh Bachchan and this year the occasion was made doubly special with the presence of Bollywood superstar Aamir Khan alongside Padmashri Dr. Kamal Haasan. The event also saw the likes of high profile guests such as the former Editor-In-Chief of The Hindu, N. Ram. Industry bigwigs such as Lakshmi, Suhasini Maniratnam, Y Gee Mahendran, Dharani, Balu Mahendra, Rohini, Sripriya were spotted at the venue. The function had its share of song and dance too with performances by Karthik and Anil Srinivasan and a traditional dance display by Shobana and Swarnamalaya. The chief guests, Aamir Khan and Kamal Haasan handed the performers a gift as a gesture of their appreciation. Both the distinguished dignitaries were also invited to light the traditional lamp as a mark of commencing the festival. 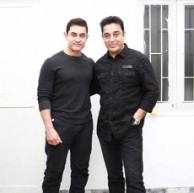 During his address Kamal Haasan said that it was his duty and need, as a fan of cinema, to congratulate this effort put together by the organizers. He took a moment to reminiscence the days when the city was screening a handpicked selection of world-class films at marriage halls and he beamed that the city of Chennai makes him proud for what it has acheived today in its upkeep and interest in quality cinema. This 8 day film festival is expected to draw in an audience strength of nearly 8000 from across the country and the world. The city’s theatres such as Woodlands, Inox, Abhirami Mega Mall, Rani Seethai Hall and Casino will play host to 165 critically acclaimed films from nearly 58 countries. People looking for online information on Aamir Khan, CIFF, Kamal Haasan will find this news story useful.